We talked about my fondness for EBCs (ethnic bakery cafes) last week and how conducive they are to a light enough lunch so as to afford room for dessert. Well, as promised, here is part two on my visit to Artopolis, one of my favorite EBCs. As I get older, I notice my dessert tastes evolving from a life long addiction to chocolate (mostly dark) to a keener appreciation for lighter brown options. By lighter brown, I’m talking about concoctions based on honey, brown sugar, maple syrup, and caramel. In the past, given the option between a chocolate lava cake or warm apple streusel with caramel sauce, I would instinctively opt for the chocolate. But now, not so fast my friends! Things like bananas foster, maple frosted donuts, and baklava-the king of all light brown desserts-are in my wheelhouse. That brings us to the pictured dessert. 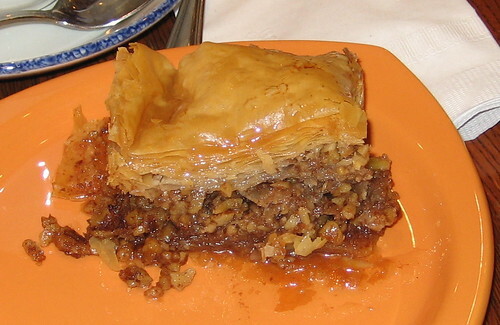 Ahh, the Artopolis walnut baklava. It’s packed with walnuts and absolutely dripping with honey. I think there’s vanilla and cinnamon in it also. Accompanied by their fine coffee, it doesn’t get much better. They even put it on an orange plate, which I love because my wife hates orange stuff, so it cuts down on the risk of her eating some of my dessert, and thereby losing a limb. When I took the first bite, I said to myself, “If some food borne virus made all chocolate and/or creamy dessert dishes in the world unsafe for consumption, I would not be discouraged because I have baklava.” I didn’t say it out loud, thankfully, because someone might have thought I was nuts. I think I mentioned before how versatile Artopolis is. They really do have something for everybody. If you go there and don’t like it, just come back a few hours later and order something else. You can’t lose. Posted in food on 2007/05/13 by John.